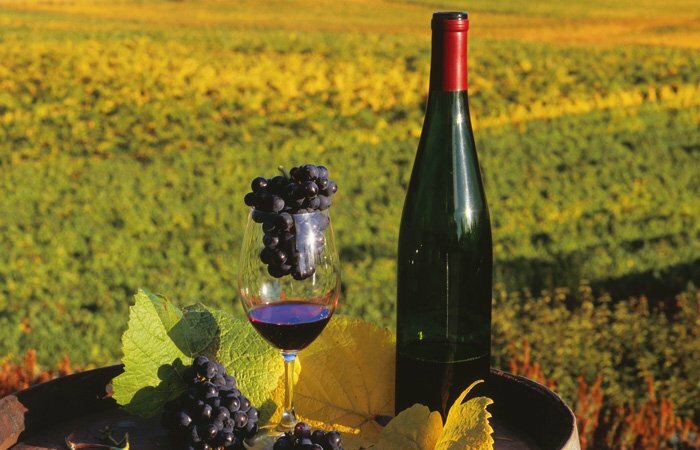 Bella Collina is blessed to be not only in the heart of Oregon wine country, but just a short drive from some of the most spectacular natural areas in the United States. These places are our backyard, so ask us about them and we can give you all the details, including some seldom-discovered little spots you will never forget. The areas seen below are just a sample of the extraordinary, beautiful areas around Bella Collina. Cape Kiwanda is a sandstone promontory jutting boldly into the Pacific. It is one of the premier locations on the West Coast to view waves, mainly thanks to a solid sandstone wall that the waves break upon. Haystack Rock, just offshore, rises boldly to silhouette the spectacular sunsets. A huge dune looms back of the cape, and is a favorite climbing spot for visitors and running-down spot for kids. Drive through the old growth forest of the Van Duzer Corridor to arrive at Lincoln City, a splendid coastal town. 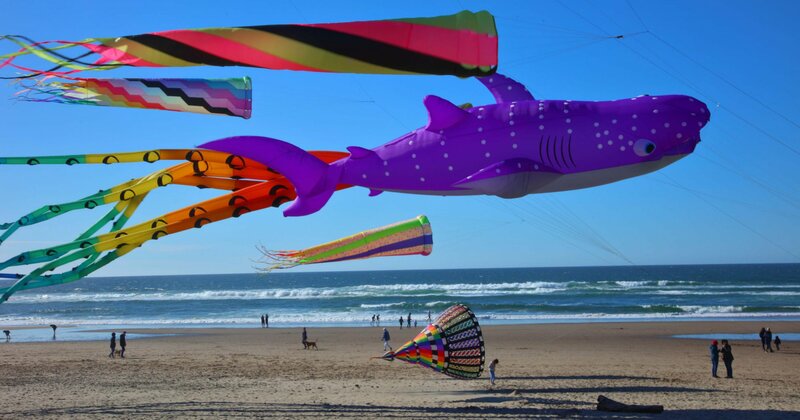 Miles and miles of beaches with colorful kites flying all year long. Scott's family had a beach cabin here, so it was a second home for him growing up. Go to Barnacle Bill's to get the best smoked salmon anywhere, and check out the fossil shop (surprisingly large for a small town). 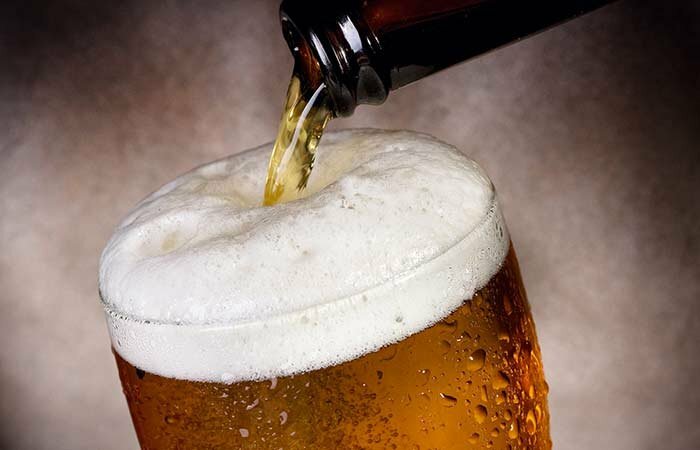 Dine at Kyllo's over the D River, the world's shortest, or at Moe's down at the Siletz Bay waterfront. Just outside of town is the Drift Creek Wilderness with old growth hemlocks and Douglas firs, plus the reward of a waterfall after a short hike. 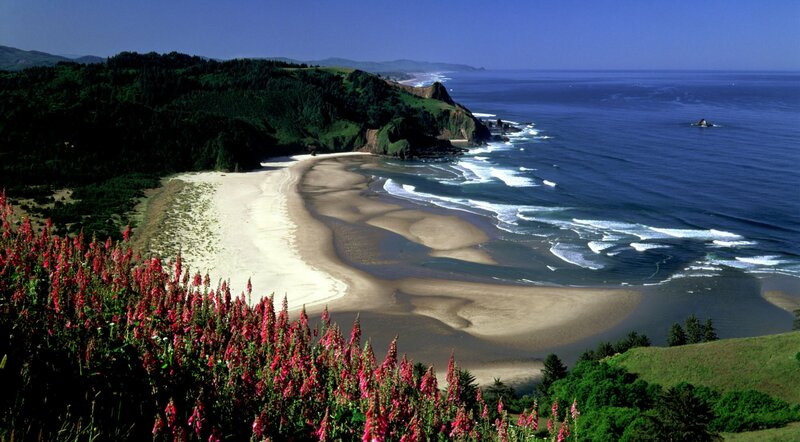 Just north of Lincoln City is a remarkable natural area called Cascade Head, the largest grassland hillside on the Oregon Coast. Rising from the Salmon River estuary to 1200 feet above the ocean, Cascade Head has two trails, a lower 4.2 mile trail (though great views start in less than 2 miles) and the upper 1 mile trail. In June, the grassy slopes are covered in flowers. The views to the south are unparalleled. It is a serene natural refuge to restore the spirit. 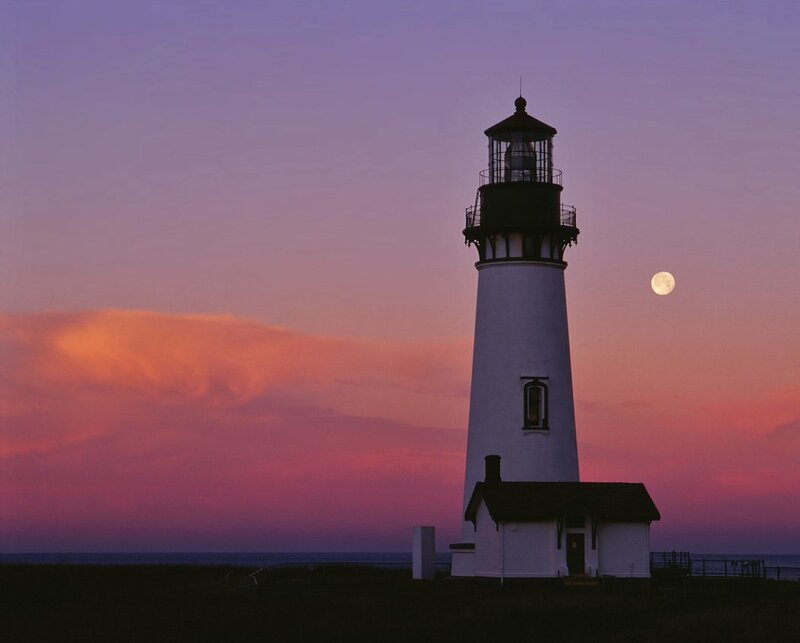 Newport boasts one of the most beautiful lighthouses in America at Yaquina Head, a basalt peninsula formed when lava from Eastern Washington flowed all the way to the coast 15 million years ago. Seal lions snooze on the rocks, puffins nest in this protected zone, and at low tide there are so, so many tide pools to explore. Then head to the wharf for very fresh and authentic sea food at one of the many excellent restaurants (the Clearwater is our favorite) and shop the galleries and stores that line the bayfront. The Oregon Coast Aquarium is a fun and fascinating look at Oregon's sea life. If you like art, you can make it yourself at Oregon Coast Glassworks. It's a perfect day-trip getaway. Silver Falls State Park--one hour drive. One of Oregon's favorite gems, Silver Falls is actually a collection of ten waterfalls along the 8.4 mile Canyon Trail. Each waterfall has its own personality, and at three of the falls, you can actually walk behind the water as it cascades down. If you look up under North Falls, you can see holes left by trees that were flooded by the lava that formed this extraordinary showcase of nature's creative power. The park is beautiful any time of year, but at its peak in October when the fall colors frame the delicate waterfalls and the spring when the waterfalls are cascading at their dramatic best. The park has short hikes, long hikes, and a 4 mile bike path. Columbia River Gorge--1 1/2 hour drive. Often called the crown jewel of Oregon, the Columbia River Gorge ("the Gorge" to us natives), is a marvel of deep canyons, including the quarter-mile long slot canyon called Oneonta Gorge, and exceptional high waterfalls. The Gorge has more and higher falls than any place in the US except for Yosemite Valley. Hikes range from a few hundred feet to many miles, so take your pick. If you have any questions, just ask us. We know the Gorge and can steer you to just the right place for your level of exertion and exploration. 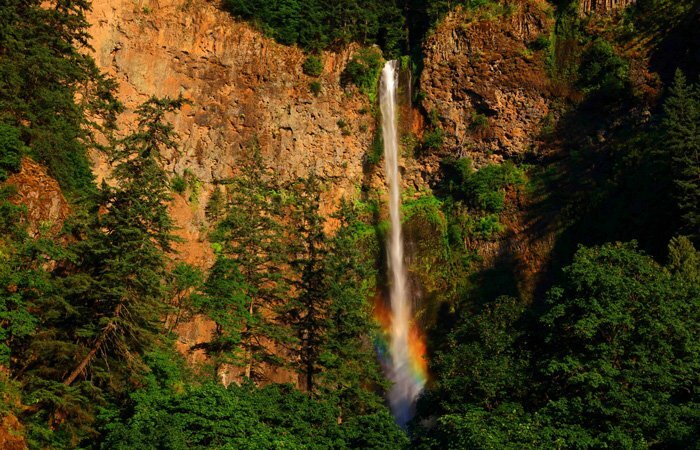 Due to a 40.000-acre forest fire in 2017, some of the premier areas of the Gorge are currently off limits, but there are still many beautiful waterfalls available to visit.